At Westside Middle School, tech isn't strictly just for in the classroom. It's for after school too. About a dozens of students in 7th and 8th grades in the tech club are taking apart a robot and putting it back together. At Westside Middle School, tech isn't strictly just for in the classroom. It's for after school too. About a dozens of students in 7th and 8th grades in the tech club are taking apart a robot and putting it back together. All the while discussing everything from code. To just whatever cool thing happened that day. Long gone are the days of just hashing out time in front of a computer drinking mountain dews...this is all about being social and collaborative. Part of working together, taking care of each other. That's where one idea came for a phone app. It's called smile time and is about fighting depression, the kids say. The students in the club recently participated in the Verizon innovative learning app challenge. In it, groups developed app concepts, learning teamwork, creative problem solving, and entrepreneurship skills. Since the contest launched in 2012, the competition has engaged more than 24,000 boys and girls in urban, suburban, and rural areas. About half the winning students are female. 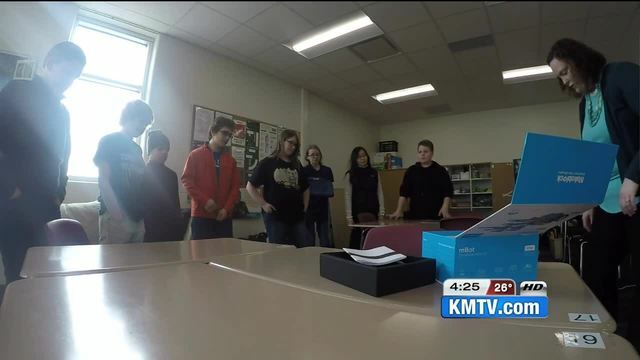 In Late January, they got the word that they were the best in Nebraska with their smiletime app idea, winning $5000 for their stem program and mobile tablets for each team member. Of course we wish them all the best of luck.